So far this has been a typical Garmin GPS. So lets get down to why it is special: Android. I know many geocachers have had reservations about such a GPSr/android device. The two biggest concerns are about being stuck on an old version of Android so their apps will not work, and the other being that the screen is not large enough. Lets address these issues head on. The version of Android on the device is Ice Cream Sandwich (4.04). While not the newest version (which is 4.4 Kit Kat), it is still quite modern. Using Android on the Monterra feels just like getting any new Android device. I was first prompted for my Google account information, and asked to set up the wifi connection. It then logged me in to a fully functioning Android experience. I even started getting new email notifications right away (an unexpected and surreal experience to do a Hangout on a GPSr). I promptly started installing my favourite geocaching apps: CacheSense, Locus Pro, GCC, Groundspeak's Geocaching App etc. All of them worked flawlessly. There were a few minor issues with performance, for example Locus Pro took twice a long (60 seconds instead of 30 seconds) to process a 1000 cache GPX file, but in general the performance was not an issue. You have full access to the Google Play Store, and the Monterra shows up as a device on the store so you can simply push apps to the device from the website. Rather handy. If you don't have any apps you want to use, the device does come preloaded with some apps. All of the typical Garmin functionality is implemented as Android apps pre-installed on the device, for example. The Settings app looks like typical Android as well, aside from a few additional menu options to configure features not normally found on phones (such as turning on WAAS, or selecting GPS/GLONASS options). In fact Android works so well on the device I forgot I was using a GSPr at all. Except for the display and larger physical size, it felt like I was using my smart phone. This conveniently segues us to the display, so lets tackle that now. So the display resolution is rather paltry sounding. At 272x480 pixels it pales in comparison to the typical modern Android device. For example my Nexus 4 has a resolution of 1280x768. So one would be understandably skeptical about how useful Android is on such a low-res screen. One would, however, be completely wrong. Now I am not going to sit here and tell you that the screen is amazing in all respects. I would never want to watch a movie on it, for example. However it is quite adequate for its needs. As you can see, the screen is quite adequate for all of its limitations. 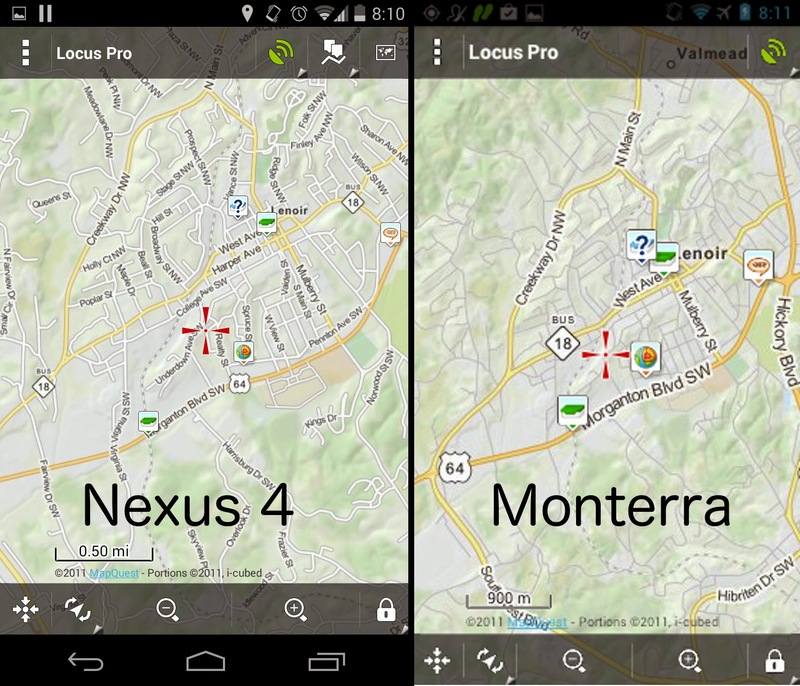 The Monterra is not as crisp as the Nexus 4, but most folks would not have any issues using those maps. Some of the menus and buttons end up in different spots on the screen, but with a very small amount of exploration I had no problems getting used to how my favourite apps worked on the Monterra. The display also looks great in the sun, and I had no problems reading it, even in direct sunlight, and with the backlight turned completely off. I was completely blown away by how polished and usable the Android experience is on this device. I was about to declare the Monterra one of the best GPSr's I have ever used. I was ready to toss away my old setup of using an eTrex 30 and a Nexus 7. That would prove to be a premature conclusion however, as there are some critical problems with the device, and they are where I least expected them.